Quantitative methods trips up lots of CFA Level 1 candidates. I think this is mostly because the material is long, boring, and comes at the beginning before most people have momentum and a method behind their study efforts. In this post we summarize some of the key discussion points around measures of central tendency: specifically the distinction between the arithmetic and geometric means. Measures of central tendency try to identify the center, or average, of a data set. We often use this information to identify the typical, expected value, of a set of data. When it comes to exam day, the CFA Level 1 exam is most likely to test you in two areas. The first centers around the pros and cons of using arithmetic means vs. a median value. The second relates to when and how to use weighted average and geometric mean calculations. The latter is the focus of this post. Be mindful that you will see these calculations throughout many of the more investment-related readings in the curriculum (see some of the basics covered in this post). The arithmetic mean is the most common measure of central tendency. It is calculated as the Sum of all the data divided by the # of observations, n.
The main problem with the arithmetic mean is that it is extremely sensitive to outliers. That is, infrequent large and small values can have an outsized impact on the calculation. For example, if your data set consists of the observations: 3,5,5,6,7,8, and 450, the mean is 60.5 which is hardly representative of the average value. The return for a portfolio is always the weighted average of its individual assets. The geometric mean is usually used when we want to calculate the average compound growth rate of an asset over time. It is always less than or equal to the arithmetic mean, with the difference growing as the dispersion of observations gets larger. When we are calculating the returns for a data set over a period of time (Rt) we need to add 1 to each return (and then subtract it out at the end) to calculate the geometric return:.. The geometric mean gives us the average annual compound return. 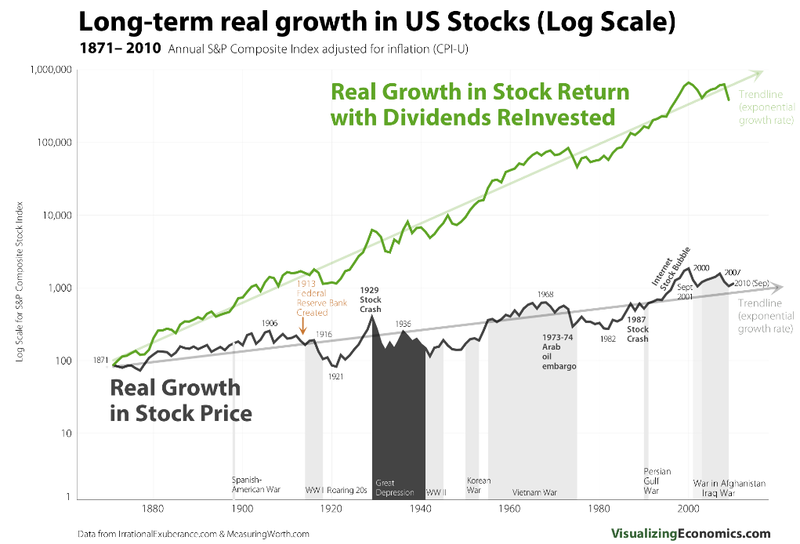 That is, it gives us the single rate that, when compounded over the given time period, would lead to the same aggregate increase in wealth as the individual annual returns. We use the geometric mean to look at past performance or to analyze multi-year returns. So let’s say we have three returns of 5, 8, and 12 percent over the last three years. To plot this past performance graphically we would use a semi-logarithmic scale, where the X axis reflects time and the Y Axis reflects the log of returns. This has the advantage of better showing percentage changes on the Y Axis. For example, on the graph below the gap between 100 and 1,000 (1000% increase) is the same as the gap between 1,000 and 10,000. A single compound growth rate would show decreasing growth rates (in % terms) over time. The arithmetic mean, on the other hand, is considered a better estimate of next year’s expected return. For the above case it would equal (5+8+12)/3 or 9.33%. Note that if we are given a decision tree with varying returns the geometric and arithmetic mean can vary quite a bit. For example if we earn 100% and -50% returns over two years the geometric mean will be 0% and the arithmetic mean would be 25%. This shows that the greater the uncertainty in cash flows or returns the larger the arithmetic mean will be relative to the geometric mean (and the larger the overall dispersion). So the geometric mean is equal to the arithmetic mean when all the observations are the same. The calculation for the population or sample mean is the same, however, we use the sample mean to make inferences about the population.